The Maze is made out of four subway lines in four cities, with four stories in which the visitor participates. We know the location of the trains at each moment, we know where they are headed and we know who is inside. One of them is you. Another one is talking. To you, sometimes. The rules are simple. You are in a train, but you disembark at each junction and wait for the next train to arrive at that station. You have no influence on this proces. The journey is without end. The trajectory our software is taking through the Maze is determined by the simple rule to disembark at each crossing of lines and get on board the next train arriving at that station, a train that could well be in another city. During the ride a story is told, but after a crossing of two lines you might have been shifted to another story. In between stations the section of the story that belongs to this specific segment is told by, presumely, a passenger on board this train, like we are eavesdropping on his thoughts or conversation. 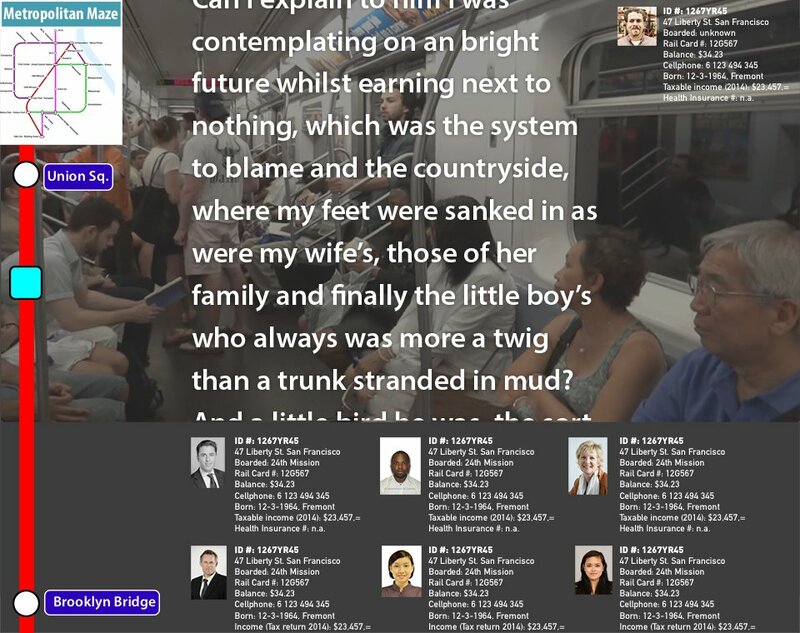 The four storylines around which the Metropolitan Maze is structured have the form of monologues of four individuals who lost their connection with society and are leading a rather lonely life, with lousy jobs or even no job at all. They feel excluded, not valued and – as it goes in this respect – the alienation to which they prey is reinforced by their lack of willpower, their inability to alter their lifes, their acceptance of the fate that has condemned them to themselves. Though living their everyday routine in different cities there seems to be some relationship between the four, by ties from the past or the deceit of the imagination. Besides the four stories and the information on where the train is at a certain moment, all kind of information on the other passengers that are on board the train is given. The passenger data that we show are derived from actual travel card and cell phone data that are available to the transport corporation, phone companies, the government and others. These data can of course be linked to tax and health insurance data, social media accounts, cloud based email services and so on. In this project we show a sample of what is possible, without actually tapping these sources live. Every time the train leaves a station on the line, the passenger data are updated. The video footage is shot on these specific lines and usually includes station calls and security messages. In a future version we might want to use the surveillance cameras on board of each train. The Metropolitan Maze will have an online interface but can also take the form of an installation. A small map of the Maze, which can be enlarged. The current section, showing the position of the train that we are following, based on live public transport data feeds freely available on the web. A video recording (with sound) from the inside of the train at this section. A transcript of the story as told by one of the passengers, running on top of the video. Relevant data and portraits of all passengers on board this train, based on travel card data and other sources. Take note: all activity on this website is logged. However, we don’t have access to your webcam. The installation is an extension of the online interface, with each interface element on a seperate screen and/or audio monitor. Execution depending on exhibition space and available budget. Design of the installation will be based on the interior of surveillance rooms. 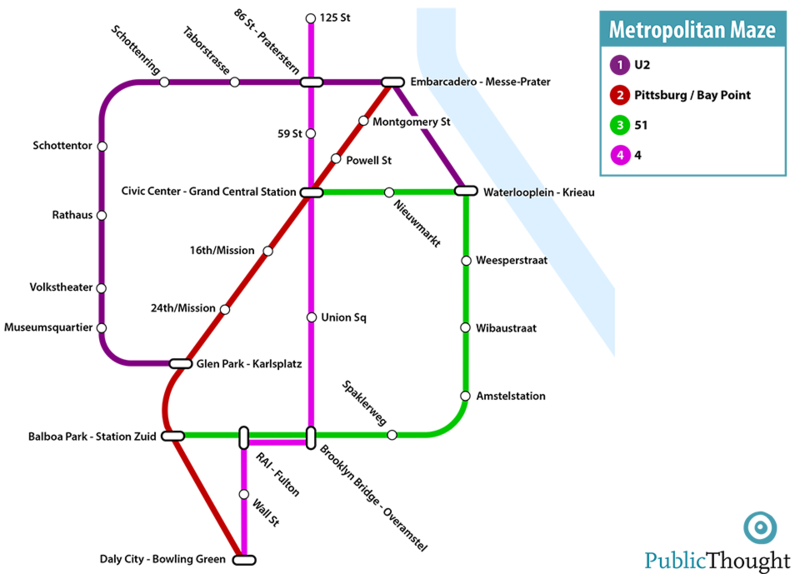 A large map of the Maze, showing the position of the train that we are following, based on live public transport data feeds freely available on the web. The map could be made as a big illuminated information display with LED lights indicating the position of the train. 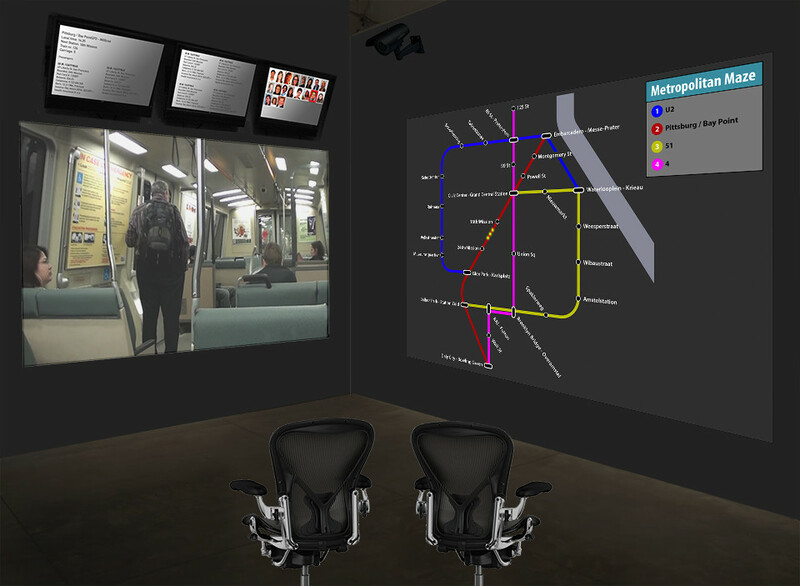 Three surveillance monitors showing relevant data and portraits of the passengers on board this train, based on travel card data and other sources. An audio registration of the story as told by one of the passengers.